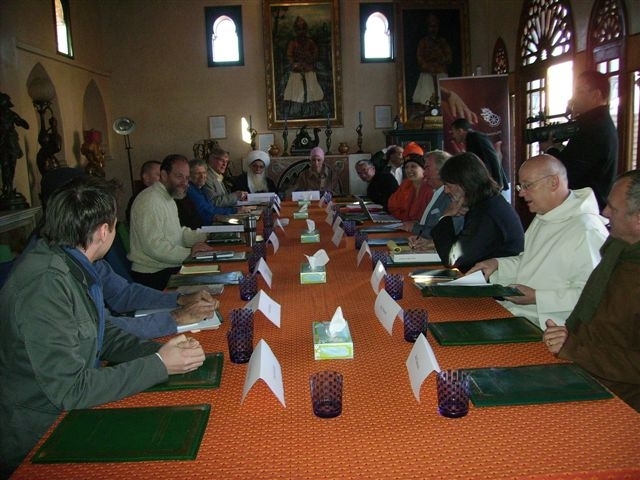 The inaugural meeting of the Guerrand-Hermes Forum for Interreligious Study of the Mystical and Spiritual Life, a project of the Elijah Interfaith Academy, was held in February in Marrakech (Morocco). The concept for the Forum grew out of the understanding that Mysticism and Spirituality occupy important places in the lives of believers of all faiths. Spirituality and mysticism potentially provide a meeting place for religions in the heart of their religious life, rather than on the common battlefield of life. They hold the promise of growth and transformation through experience, inspiration and emulation. Little work has been done on spirituality in an interfaith context, exploring its meaning for interfaith relations and carrying over the results of such study into the community. The Guerrand-Hermes Forum for the Interreligious Study of Mystical and Spiritual Life, made possible through the generosity and inspiration of Simon Xavier Hermes Guerrand, seeks to deepen reflection on the range of questions associated with both mysticism and spirituality as bridges and meeting points between religions. It seeks to do this on the theoretical level, as well as to engage in forays into the possibility of sharing practice and experience across religious traditions. The participants in the Forum are not simply academicians and theoreticians but exponents and practitioners of these traditions. 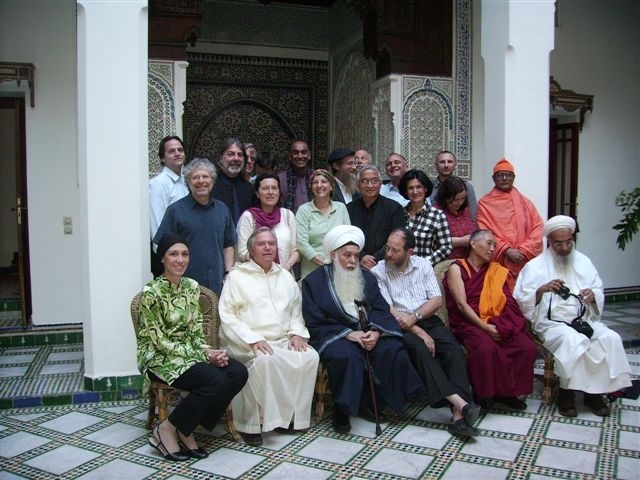 In bringing them together, one seeks to not only cultivate common reflection, but also to be open to practices from other spiritual traditions and to how they may in fact either point to spiritual common ground or enrich the experience of practitioners from other traditions and their religious experience. Participants at the meeting were drawn in the main from the two existing bodies of the Elijah Interfaith Institute: the Elijah Board of World Religious Leaders and the Elijah Interfaith Academy. The Forum is intended to bring together a select group within those larger bodies as a specific interest group that seeks to deepen, over the long run, reflection within one domain that is more closely related to broader spiritual concerns, than to specific contemporary social challenges. a. To form a community of scholars and religious leaders who will engage the issues of this particular forum over the coming years. b. To forge a common conceptual language acceptable for all the participants from different religious traditions, through which these issues will be engaged. c. To establish an agenda and a program for the Forum’s work in the coming years. Prior to the meeting, participants had been asked to write a short position paper, answering a set of questions, comprising questions exploring the theoretical significance of mysticism and spirituality and questions concerned with the possibility of sharing and borrowing practices between traditions. This reflects the dual emphasis of the Forum. The position papers were disseminated among them several weeks in advance of the meeting but they did not serve as the focus for discussion at the Marrakech meeting. Rather, they informed the conversations as background materials. The meeting did not seek to engage in the actual work of sharing insights concerning the mystical and spiritual life, as these are articulated in the different traditions. Some of this did happen, either as the conversations unfolded, or in small groups and informal settings. Most of the conversations took place within the broader group; some conversations took place in small groups, that were divided according to interests, and which sought to work out specific issues that arose in the plenary. The meeting focused also on the products the Forum hopes to achieve and how this process might advance. It was agreed that the first priority was making available resources from our traditions that shed light and offer insight on the spiritual and mystical life. Over a number of years, a spiritual resource library will be created that could be accessed either through the internet or through the publication of small and inspirational individual tractates, each devoted to a core theme, reflecting the approaches of multiple religious traditions. a. Entering the spiritual life – what are the dynamics and processes that drive and inspire the entry into the spiritual life? How does one begin the movement from the outer rim of the circle, representing external religious practice, to the inner heart of the circle? How do our religions conceive of this movement? Our religions have various terms to designate this process, such as metanoia, teshuva, entering the stream and more. Working on sources that focus on this point of transition seemed an appropriate starting point for the actual work of our Forum. b. The spiritual life and daily life. Many suggested that this might provide an important point for reflecting on the spiritual life. How is the spiritual life expressed in, balanced with, or otherwise related to, daily life? What are practices that ground it, routines and rhythms that support it and wise counsel that facilitate the integration of spiritual and, or spiritual in, daily life. In addition to the study and gathering of sources, some felt that it would be appropriate for our project to offer joint workshops and teachings on the theme of spirituality. An additional idea that was raised was holding interreligious retreats for religious leaders. Forum members signed up to working groups on one of the above mentioned topics and on the idea of collaborative spiritual teaching. One important dimension of the meeting was the sharing of spiritual practices. We had engaged in such sharing at various points throughout our meeting. Friday was particularly intense in this way. 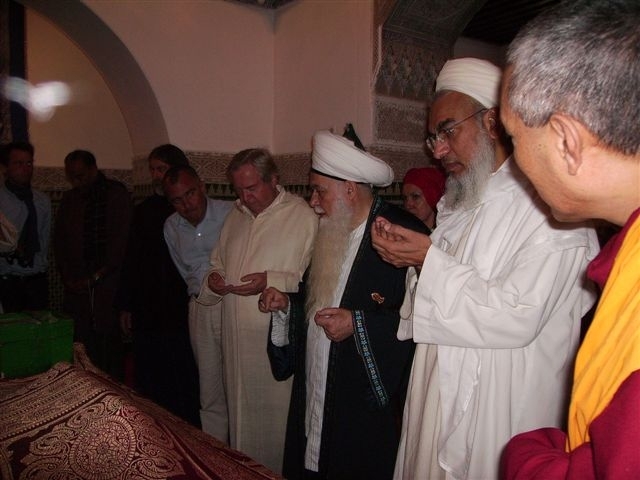 We joined Sheikh Kabbani as he made a pilgrimage to the seven saints of Marrakech. It is a tradition of old that the visitor to Marrakech first visits these seven saints and only then takes up his business. Nowadays, non Muslims are not allowed to enter Muslim religious sites. It therefore required special permission from Morocco’s minister of religious affairs (Dr. Ahmed Toufiq, a member of Elijah’s Board of World Religious Leaders and a close personal friend of Mr. Hermes), for the entire interreligious assembly to join in this pilgrimage. Following this visit, participants shared in the celebration of the Shabbat, first in a rooftop ceremony, followed by a traditional ritual Shabbat meal. Saturday morning featured a Jewish ceremony of singing and chanting from the Psalms and a session of Tibetan Buddhist meditation. One should mention that during the seminar we also practiced Dhikr with Sheikh Kabbani, together with a mixture of scriptural and silent meditation, led by Fr. Laurence Freeman. And one must not forget that a constant meditative dimension was added through the musical interludes offered by Rabbi Daniel Kohn’s clarinet. These opened and closed most sessions, creating a space of inspiration and longing that reminded us of the higher aspirations that inform the lives of all participants in the Forum. One of the key challenges of the inaugural meeting was to define what we mean by the terms ‘mysticism’ and ‘spirituality’ and how these relate to the term ‘religion’, in order to best describe the work of the new Forum. It is recognized that multiple definitions exist for both terms. A great wealth of understanding was found in the background position papers and this wealth was also reflected in conversations. Despite the diversity of theoretical positions on these questions, it was noteworthy that some kind of consensus did emerge: we can begin by saying how mysticism and spirituality are different from other parts of religion, including the institutional dimension of religion and its social structures and the various performances of religion, especially as these are mandated by the legal structures of the religion. This latter point was particularly obvious for religions that structure the religious life and practices of their believers by means of law, such as Judaism and Islam. But it also emerged as meaningful for Hinduism, where a strong ritual tradition exists, and where similar dynamics can be identified in relation to, and in opposition to, such a ritual framework. Thus, mysticism and spirituality are something other than these public and external dimensions and indeed they frequently appear within the tradition as an opposition and alternative to these exterior dimensions. ‘Spirituality’ was accordingly identified as that movement that takes one from the external, outward, social towards the internal, purposeful and ultimately transformative dimension of the religious life. One way of capturing its importance is by appeal to the heart, in a continuing movement towards the heart, as it informs the broader meaning of the entire religious life. Spirituality would thus be the entirety of processes, intentions, actions and methods by means of which one seeks to move beyond external performance to what is perceived as the core of the life of the religion. Spirituality may otherwise be presented as the totality of the path toward the ultimate goal of the religion. According to such an understanding, ‘mysticism’ is what one arrives at, upon reaching the core. It is often characterized by a realigning of balance and perspective, where the actor encounters something beyond and is, or feels herself, no longer exclusively responsible for what transpires in the spiritual movement. Mysticism is accordingly an intensification of the spiritual life, as it reaches a point of encounter, or as it reaches a goal, the goal. ‘Mysticism’ and ‘spirituality’ may thus be placed on a continuum, with mysticism as the intensification and fulfillment of the path, entered through spirituality. According to this description, both mysticism and spirituality are domains in which the Forum should engage. As they form a continuum, they cannot be strictly separated from one another. What was refreshing about the discussions was the fact that many of the voices that contributed to the consensus came from non-Christian traditions, thereby making the consensus itself an interreligious process, rather than the oft-feared alternative, according to which all traditions conform to the standards, terms and definitions of one governing tradition, usually Christianity. The definition arrived at relied on structural similarities in the process of the spiritual and mystical life, rather than on the specific content of faith of the traditions. This addresses concerns voiced by Buddhist participants, who could not relate to ‘God’ as the goal and focus of the spiritual and mystical process. By identifying a common structural process, it was possible to identify what it was we were talking about, across our traditions, thereby identifying significant commonality, while placing aside the many divisions that distinguish one faith from another and, above all, the distinction between theistic and non-theistic traditions. The definition at which we arrived had an important advantage, or affinity, from the perspective of the Elijah Institute. Elijah’s logo is a circle, with spokes working their way to the common center of the wheel. As one of the participants was presenting the above understanding of religion, spirituality and mysticism, he inadvertently drew Elijah’s logo. Religion was represented by the outer rim of the circle. The spokes leading inwards were identified with spirituality. The heart of the circle was mysticism. Elijah’s logo is actually of such a circle on fire, suggesting dynamism and rotation of the wheel. This was itself an important dimension of our conversations. It was recognized that the circles we had been drawing, in an attempt to gain clarity on the various uses of the terms, were all static, and that we were in fact talking of processes. In an attempt to do justice to the dynamic nature of mysticism and spirituality and to the fact that they are processes, rather than ‘isms’, we have chosen to refer to them hereon as ‘mystical and spiritual life’. Reference to the name of the Forum, as in the title of the present report, has been adjusted accordingly.